Today I was had the opportunity to meet Lillian Kimko, a single mother who owns a sewing and tailoring shop near Ahi River just outside of Nairobi. Lillian is quite tall and has a lovely warm presence. I am invited into her shop and her employee who is also named Lilian prepares me tea and Mandazi, a local fried dough, that tastes especially delicious with the tea. I soon come to find out that the beautiful red dress she has on, she made herself. It is obvious that she knows what she is doing when it comes to tailoring to fit just right, which is not an easy skill. 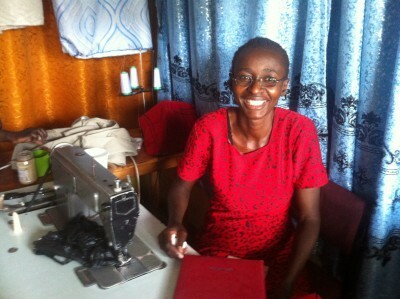 Lillian learned sewing and tailoring in 2009 from an NGO offering classes for 500KES (5 US dollars) to women from the community. Lillian excelled at the courses and was hired to work production at the NGO. After working there for six months, a teacher recommended her to a friend and she was offered a different job in downtown Nairobi which paid well and at the same time trained her in sewing interior decoration items like curtains and pillow cases. Lillian worked there for two years, but with the commute she would leave work at 5pm but not arrive home until 9pm. Nairobi traffic is that bad. Having a young daughter, she decided that she was spending too many hours away from home and that is when she came up with the idea to begin her own sewing shop, starting it out of her home. Now she has a thriving shop in a different neighborhood in Nairobi. Lillian began pursuing sewing and tailoring at the same time she became a widow and needed to support her daughter without any help. They had been married since Lillian was 25 years old, and he died in 2009 due to complications from diabetes. When we talked about her late husband, it was apparent he was a very good man. When Lillian was 25, her father died and her mother abandoned Lillian and her six younger siblings. 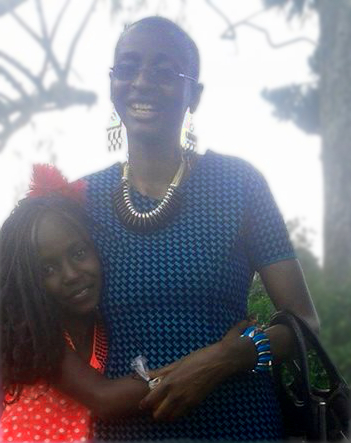 At the time Lillian was studying mechanical engineering at college in Nairobi. She was set to become the first woman ever to graduate in the field, however when her father passed, she could not afford to pay the 160,000KES ($1,600) in school fees and was barred from taking her exams. Not only could she not afford school fees, but her mother leaving left her to take care of her younger siblings. WIth no job, Lillian was completely desperate. Fortunately, and she calls him a gift from God, she met her husband at a party with friends. After two months of dating they married, and he shared the responsibility of the care of her younger siblings and the siblings ended up looking to him as a father. She is very thankful to Zidisha lenders for supporting her. Without them she says she would not have started the shop. 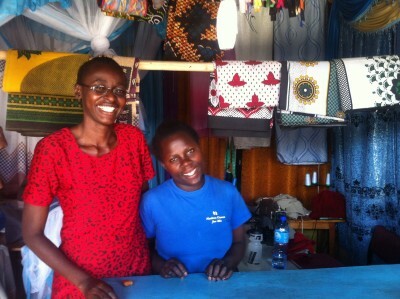 With their support, she has purchased a larger sewing machine, tailoring accessories and inventory for her shop. She dreams that in the future she will have not one, but three different shops strategically positioned in other neighborhoods of Nairobi. She also even thinks of using the profits from her business to return to school and take the exams that she was meant to take 15 years ago. For now, she is focusing on her daughter and harbors hopes that she will want to study engineering in the future (though now her daughter is more interested in hairstyling and being a model), and that the profits will pay for all her schooling. I know that with Lillian’s positive attitude and the help of Zidisha, she will complete all of these goals. Posted on May 10, 2015 by Julia Kurnia. This entry was posted in Uncategorized. Bookmark the permalink. ← Zidisha launches in Haiti!